Some time this year I got on a magical email list. What kind of magical list you might ask? Well, it’s one that sends out opportunities to review new books before their official release! I know this is a food blog but I love books. I’ve received two dozen or so emails this year with press releases for books that I could review here, but none of them were books that I thought you all would enjoy so I passed. Then September rolled around and Christmas books started to find their way into my inbox. Not just any Christmas books mind you, children’s Christmas book! I just could not pass on the chance to check out a few new Christmas books and so I have a three book reviews scheduled for this month. I really think you’ll enjoy the posts, or I wouldn’t have said I would do them. They aren’t paid or anything, but I do get a copy of the book (payment enough!). My first review was for the enchanting book God Bless Us, Every One! by John Rhys-Davies and Brandon Dorman. This beautifully illustrated volume tells the story behind the writing of Dickens’s most famous work and reveals how he discovered the spirit of Christmas for himself—with a little help from his own literary characters. 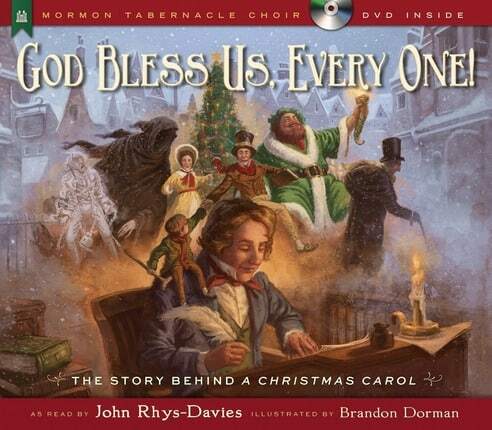 Originally presented by acclaimed British actor Joh Rhys-Davies at the Mormon Tabernacle Choir’s 2013 Christmas concert, the book also includes a DVD with footage from the event. I love back stories and historical context information, and this book had just those things surrounding Charles Dickins’ writing of A Christmas Carol. We really liked the story, it was beautifully illustrated, and the bonus DVD sealed the deal. It was a little long for a bedtime story or for reading to small children, but that doesn’t mean you couldn’t read it in sessions. I love stories that illustrate a point, and this, like A Christmas Carol, embodies the true meaning of Christmas… service, love, and thinking of others. I’m so pleased to have added it to your ever growing Christmas story collection and I highly recommend you add it to yours. It is also for sale at Deseret Book. Thank you so much for joining me on this book review. It was a keeper! Are you a Christmas story book collector too?